Note: mid-June to September is peak season, and there are many more boats on the river. We highly recommend taking a shared cabin/shared boat during peak season, as it is a more environmentally-friendly option. We also recommend avoiding the crowded river destinations during peak season, as there are many more tourists. We offer a number of different options during peak season. We offer the 3 Day/2 Night Classic Trip (option A) in January, February, March, April through June 1, October, November, and December. Enjoy the peace and serenity of Filomena Camp on the Sungai Bulu Kecil (Little Buluh River). This tributary to the Sekonyer River in Tanjung Puting National Park is set in magical lowland forest which is a rich and diverse location for birding. Note: in an effort to preserve this rapidly disappearing ecosystem, we strive to use corn and coconut oil, instead of palm oil, when available in our local markets. Curious if palm oil is in prepared foods you are buying? Try this app and find out more about palm oil. 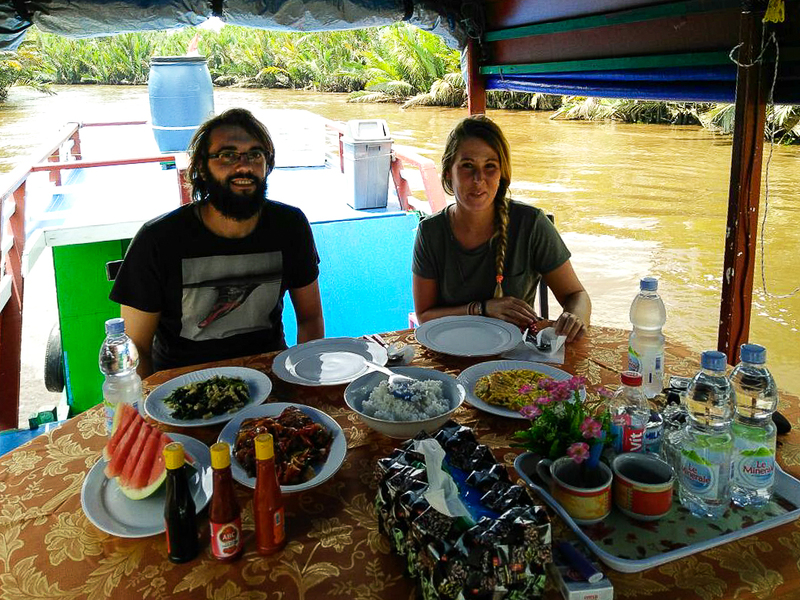 One of our English-speaking guides will meet you at the airport at 10:30 in Pangkalan Bun (PKN) and accompany you to the klotok houseboat in Kumai (about 30 minutes by taxi). There you will meet the crew (captain, assistant captain, and cook), who will travel with you during your tour of Tanjung Puting National Park. From Kumai, we will journey across the harbor to the estuary at the beginning of the national park (about 25 minutes, depending on the speed of the klotok). As we travel up the Sekonyer River, your guide will explain about Tanjung Puting National Park. If we are lucky, we will spot some wildlife, possibly crocodiles and several species of monkeys. 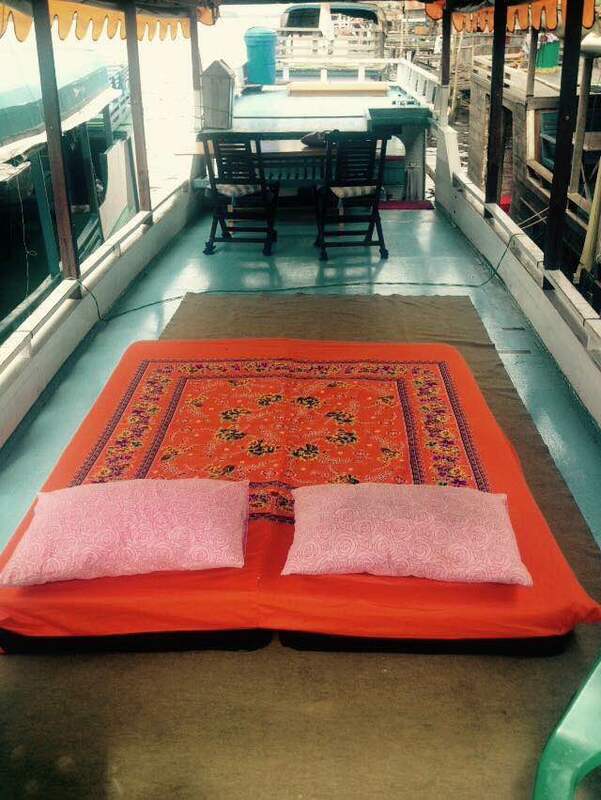 Your cook will prepare a delicious lunch as we journey upriver. It takes approximately an hour and a half to travel from the national park estuary to the first camp, Tanjung Harapan, just in time for the 15:00 pm feeding. When we arrive at Tajung Harapan, we will walk through the screw pine and bog forest, and your guide will explain about Tanjung Harapan. 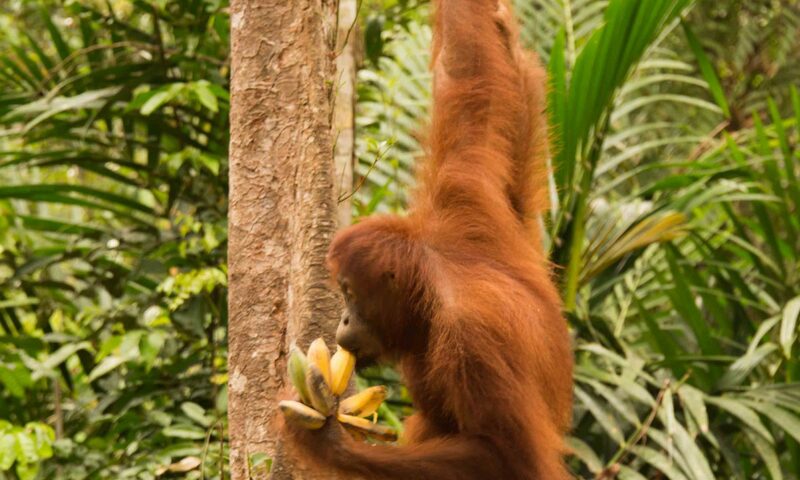 We will enjoy the orangutan feeding station until 16:20 pm, then return to the klotok, where the cook will serve an afternoon snack and soft drinks. As we travel upriver, we will watch for proboscis monkeys (endemic to Borneo), macaques, gibbons, and other wildlife. We will stay overnight on the klotok, where the crew will serve dinner and prepare your bed with mosquito netting (L, D). We will wake to the morning jungle melody, and the sounds of birds and gibbons will accompany your morning breakfast (scrambled eggs, toast, coffee, tea, juice, and other creative additions prepared by the cook). We will travel to the next camp, Pondok Tanggui, home to pre-wild and adolescent orangutans, as well as deer, boar, rangkong bird (rhinoceros), raja udang bird, and the sesep madu bird. The area between Tanjung Harapan to Pondok Tanggui passes through the habitat of the proboscis monkey and the estuarine crocodile (Crocodylus porosus). We will arrive at Pondok Tanggui, the second feeding station, in time for the 09:00 morning feeding. The Tanjung Puting National Park ranger will bring the orangutan’s food to the feeding station, and we will enjoy the scene until 11:00. 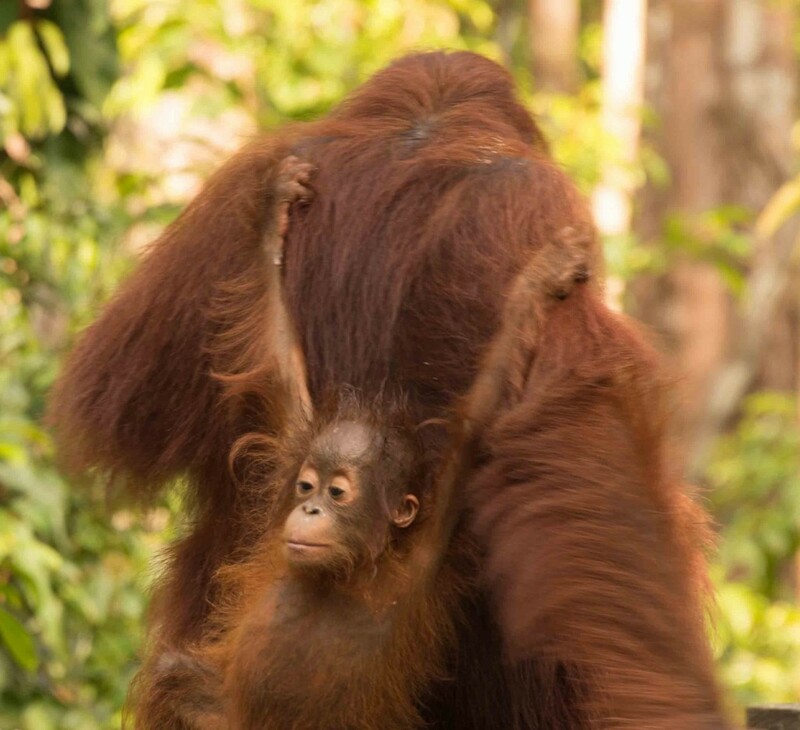 Here it is common for the mother orangutans to bring the baby orangutans and children to the platform, where they will swing and climb from tree to tree, as the rangers call to them. We will return to the klotok and enjoy lunch around noon, as the klotok travels the two hours to Camp Leakey. This part of the journey will pass through more proboscis monkey and the estuarine crocodile (Crocodylus porosus) habitat. As we travel, notice that the Sekonyer River is brown, as there is gold mining upstream, which helps support local people, even though it is bad for the environment. There is a junction in the river where we turn right to go to Camp Leakey, and here you can see the natural, black color of the uncontaminated river. 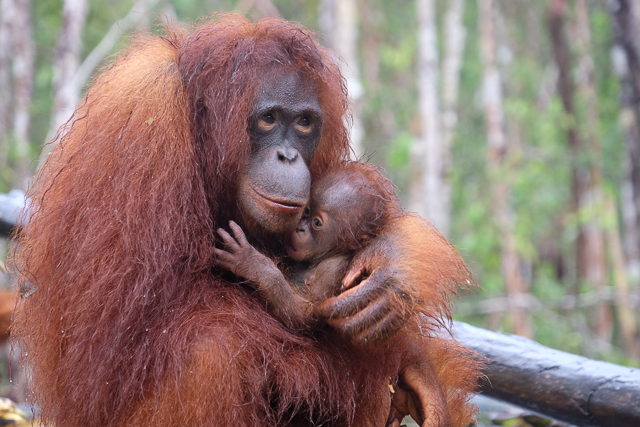 It will take approximately two hours to travel from Pondok Tanggui to Camp Leakey. Along the way, we can enjoy the riverbank wildlife, forest, and plants, as the river narrows. Camp Leakey was established in 1971 by Professor Birute Galdikas, a student of Professor Louis Leakey. Professor Leakey was also known as a mentor to Jane Goodall and Diane Fossey in their study of chimpanzees and mountain gorillas. This area is devoted to the research and rehabilitation of adult orangutans; here you can witness pre-wild or wild orangutan rehabilitation. Owa-owa, bald eagle, sesep madu bird, and hornbill (enggang) or rangkong may also be spotted. 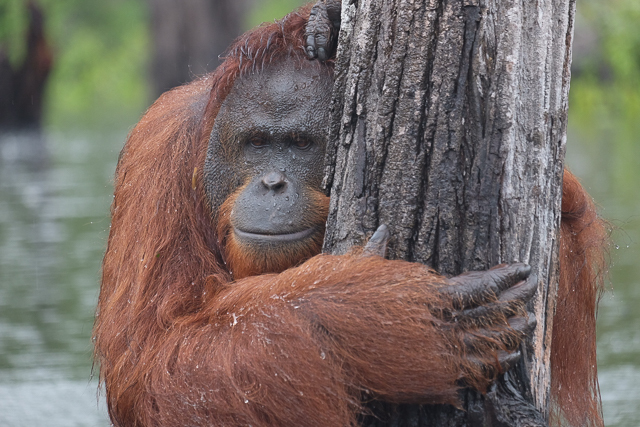 A sign warns visitors that it is forbidden to feed the orangutans or touch the orangutans. The sign also warns visitors not to swim in the river, as there are many crocodiles. 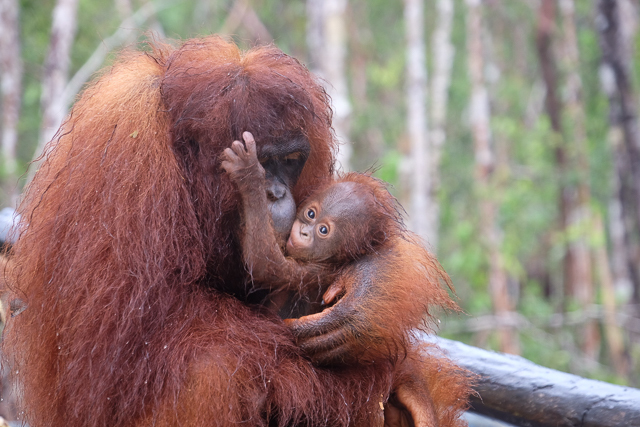 The feeding time is 14:00 and most of the mother orangutans and babies will be waiting for the ranger to feed them. We will wait as the orangutans come up and down the platform, and if we are lucky, we will meet the king of Camp Leakey, the orangutan male named Big Tom. We will enjoy the scene until 16:00, then return to the klotok to enjoy an afternoon snack and soft drinks. We will watch for wildlife along the riverbank as we journey to a quiet spot on the river to stay overnight and enjoy dinner. If it is not rainy or full moon, fireflies may dance in the night (B, L, D). We will wake to the morning jungle melody, as the cook serves a delicious breakfast and we travel toward Camp Pesalat. 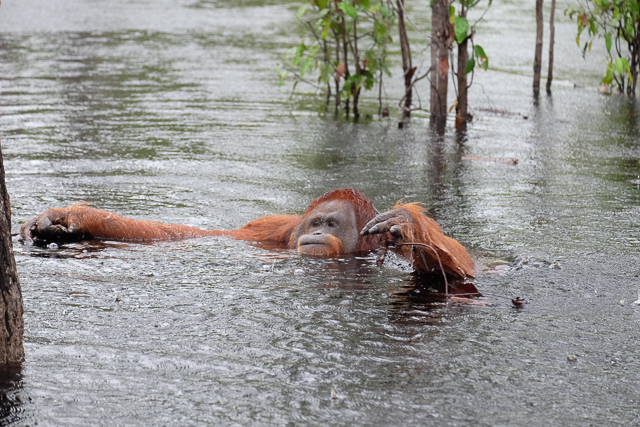 This planting and reforestation area is operated by the Friends of the National Park Foundation (FNPF), which has an important role in preserving and restoring the orangutan habitat. This has always been an important part of preserving Tanjung Putting National Park’s ecosystem, but is even more important after the 2015 Indonesian forest fires. When we arrive at Camp Pesalat, we will take a short trek to the camp, where the ranger will welcome us and explain about the area. We will have the opportunity to participate in the re-planting and make a donation to the trees here. 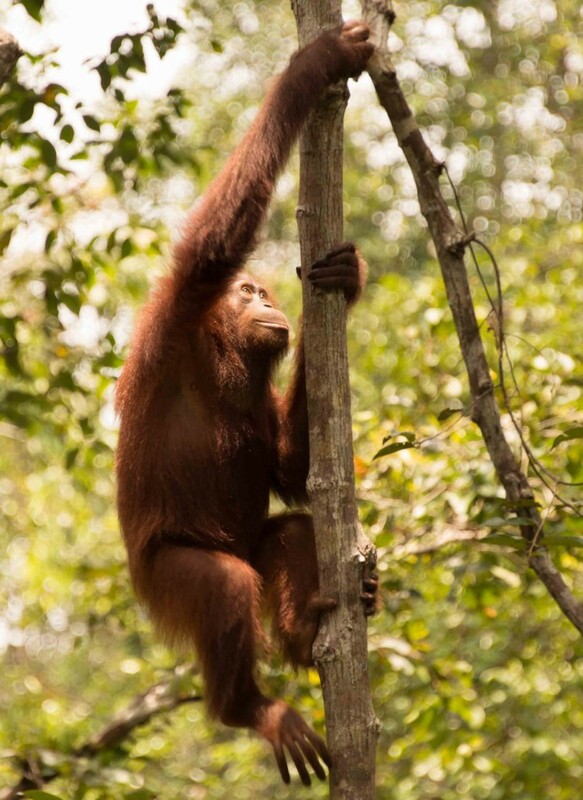 The ranger will explain which seedlings are best for replanting and reforestation, and what plants are most useful for the orangutans and other wildlife. You will select your seeds and and plant them, using hoes and spades, after the ranger takes you to the planting site. We will return to the klotok and enjoy lunch, as we travel to Sekonyer Village, a small village of about 500 people. Here we will walk around and learn about the Malay ethnic activities, about local culture and about their daily lives. We will have the opportunity to purchase creative, handmade items, if you would like to take a gift for your family or friends. Note: Tanjung Harapan was devastated by severe fire in 2015, so we offer the option of planting at Pesalat or Tanjung Harapan. We will then return to the klotok and travel downstream to Kumai. The tour will finish at 12:30 in Kumai, which is a short trip to Pangkalan Bun (PKN) airport (B, L). Enjoy breakfast on the klotok while traveling downstream to Kumai. We will arrive in Kumai by 07:00, where a car will meet the klotok and take you to Kubu Beach. From Kubu Beach, you will take a smaller klotok (gethek) for the one hour trip to Tanjung Kluwang Beach. Tanjung Keluang, a small conservation project ran by the Indonesian Nature Conservancy Agency (local name, BKSDA), where green turtles (Chelonia mydas) and hawksbill turtles (Eretmochelys imbricata) are protected and released. Tortoises, terrapins, and turtles (from the order Chelonia) are threatened due to excessive egg collection, beach development, fishing, and pollution. For more information about the turtle sanctuary, see Tanjung Keluang on the other eco tours page. A ranger will meet you at Tanjung Keluang and he will explain about the area. Enjoy the view at the beach, and return to Kumai at 12:00, where we have lunch at a local restaurant. We will drop off at Pangkalan Bun (PKN) airport for your next destination. Flores Homestay has room with small verandas overlooking the Sekonyer River. 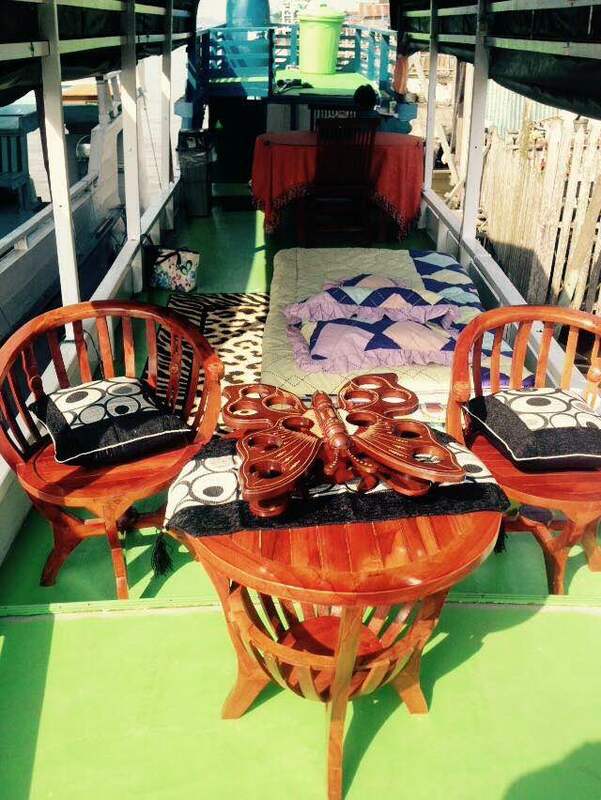 Wake up and enjoy breakfast on the boat, then return to the room to pack. We will head down river to Tanjung Harapan camp and the screw pine and bog forest. We will participate in a tree replanting project (each tree costs 50,000 IDR), then return to the klotok. 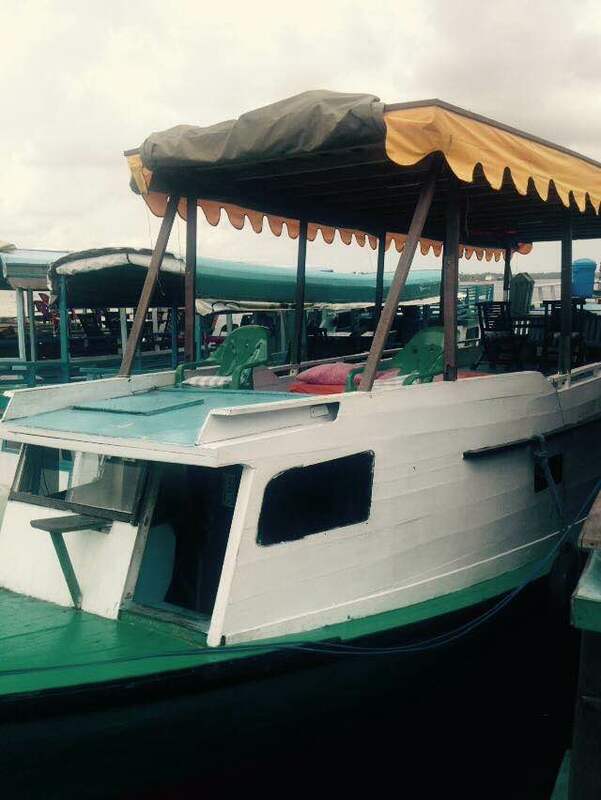 We will return down river to Kumai, where we will have lunch at a local restaurant. The tour will finish at 12:00 and we will drop off at Pangkalan Bun (PKN) airport for your next destination. See day 1-2 of classic klotok trip. Meet the ranger at the second station, Pondok Tanggoi, after breakfast. 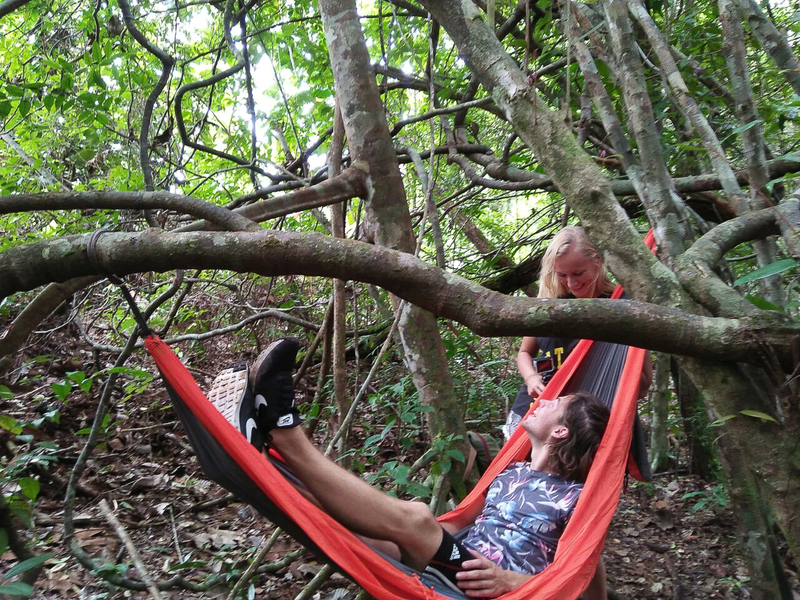 Trek 4-5 hours through the jungle. Take lunch in the jungle, and camp overnight in a tent mid-jungle, with your ranger guide. Wake in the jungle for breakfast, then trek back to the klotok. We will journey to Camp Pesalat. See day 3 option A for more information about Camp Pesalat and the reforestation program (each tree is 50,000 IDR and a separate cost from the tour). We will return to the klotok and have lunch as we journey downriver to Kumai. The tour will finish at 12:00. 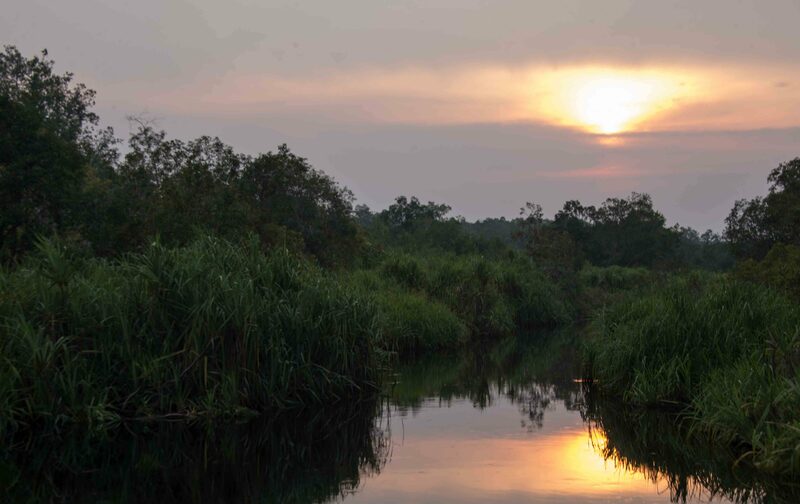 We encourage you to stay a little longer and enjoy and explore our beautiful Kalimantan! We offer other eco tours and cultural tours, and there is a variety of local lodging options. We also suggest allowing a little extra time, as there can be delays due to weather, etc. when traveling to and from Kalimantan. The rate includes: taxi to/from the airport to Kumai; boat (klotok); English-speaking guide; boat captain; cook; meals; snacks; drinks (bottled water; soft drinks; tea; coffee); and national park permits (including camera fee and boat docking fee). Prices for the Tanjung Puting orangutan tour do not include gratuities for the crew (tour guide, boat captain, assistance captain, and cook). Central Kalimantan is a predominantly Muslim area, so alcohol is not sold or served. The klotok rate includes lodging and meals. 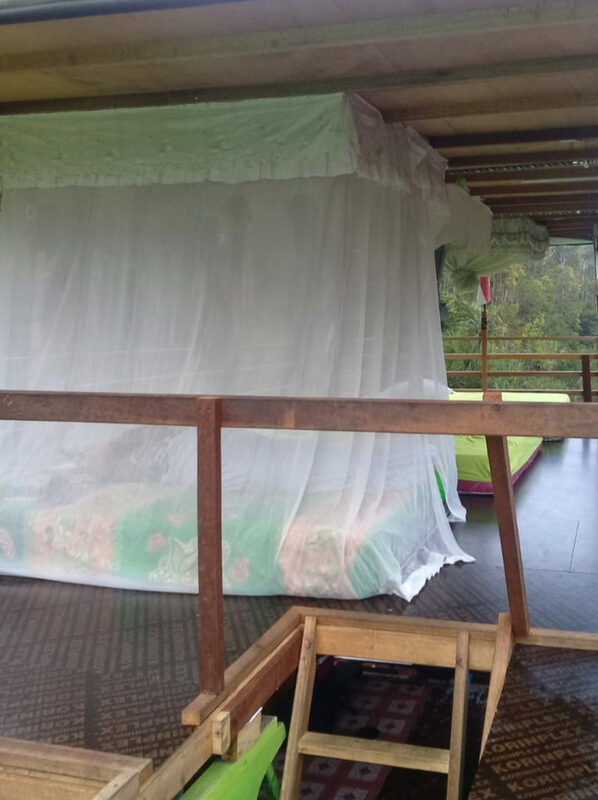 You sleep on the covered top deck of the klotok; the crew provides single or double bed mosquito nets. There is a simple shower onboard, but if you want more creature comforts, you might want to stay at a Sekonyer village homestay or Rimba Ecolodge (see Local Lodging section for more details). You can arrange three full days on the river if you stay an extra night or two in the delightfully small port town of Kumai, Rimba EcoLodge (on the edge of Tanjung Puting), or Yayorin’s ecolodge. 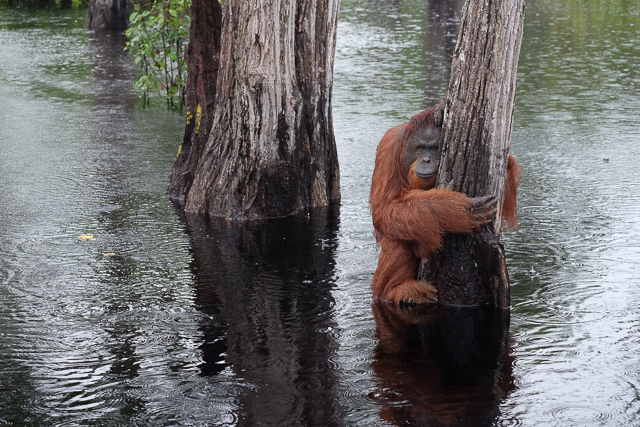 Three full days provide additional orangutan viewing opportunities and serenity, as you have more time on your klotok and solo time on the river. We can, of course, arrange custom-designed tours and more time in the jungle or on the river, if you wish. Please note, peak season is May-September, and prices will be higher. Please bring two copies of your passport for the police and national park permit. There is a photocopy shop in Kumai, but it is sometimes closed.